Every seller needs to setup a trading account to begin listing and selling their products. 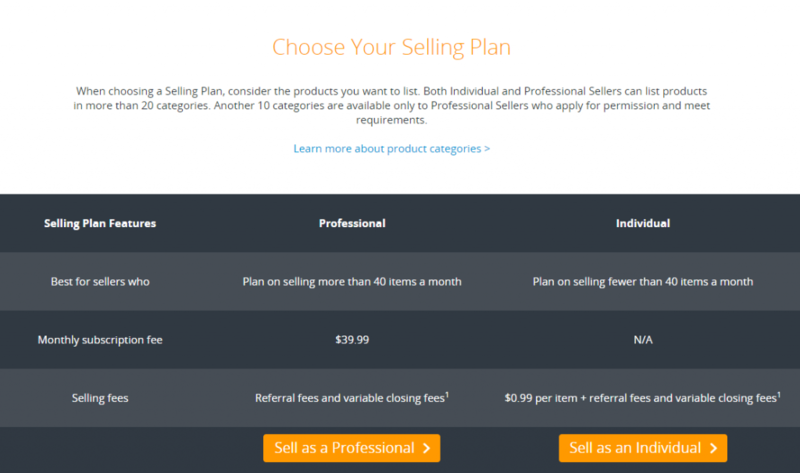 Amazon offers two selling plans: Individual & Professional. 99% of private label sellers will need a Professional account but for those looking to start slow or sell intermittently, there is also an Individual account option. These accounts are geared towards low volume and intermittent sellers. They are quick and easy to setup with $0 monthly fees. Some products require approval to sell and can only be sold through Professional accounts. A seller can always begin with a Individual account and upgrade to a Professional account once the volume of sales justifies it. This can be done quickly and easily under the seller account settings. These accounts are geared towards high volume businesses. They have a greater feature range with a flat $39.99 monthly fee. A professional account will still attract the monthly fee of $39.99, even when no products are listed or sold. There isn’t really a great amount of thought that needs to go into this decision. Any successful Amazon business should be using a Professional account. With the relatively small fee of $39.99 p/m and a whole host of features, it represents great value. Obviously every seller has a different set of circumstances as they build their business. So use the information above to make a considered decision about which account best meets your needs. And remember, you can always create an Individual account and upgrade to Professional later! Finally, after the seller account becomes active, the seller profile page can be updated. This page includes information about the business, its policies, its background and any other pertinent information the seller wishes to share with its customers. For additional Amazon Business Support, please contact us or check out our comprehensive consulting services.